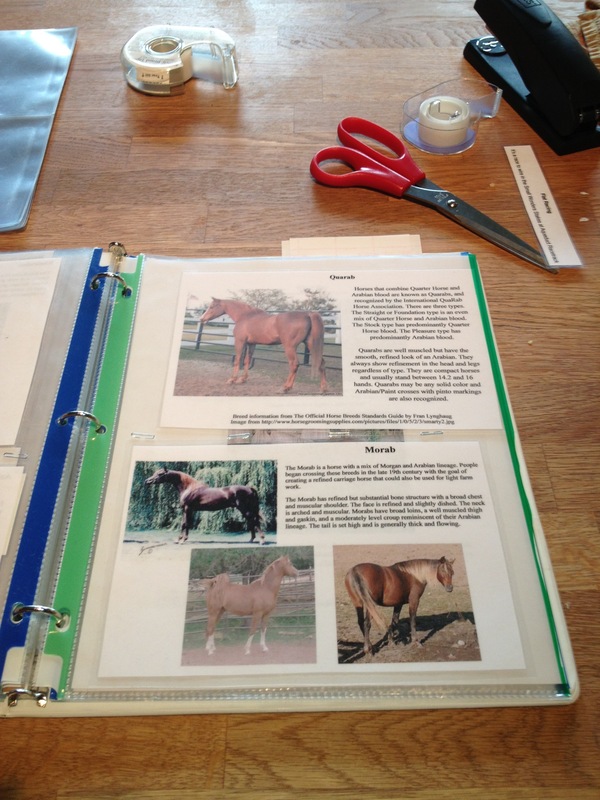 I love a lot of things about this hobby- I love the horsey aspect, the learning, the crafting, the people… and I love how often it gives me an excuse to organize. I loooove organizing. I get maybe a scary amount of pleasure from things like binder tabs and well formatted lists. In preparation for the show this weekend, I wanted to better organize my documentation. Sure, I had it all laminated and in plastic sleeves, but isn’t it just an absolute hardship that I had more than one in each sleeve and sometimes they covered each other and I couldn’t tell exactly where they were? Oh, the humanity! So armed with a stapler and some fresh sleeves (not too fresh- they’re from Goodwill) I set about making a pocket for each reference. A line of staples down the middle keep the two references from sliding around, and a slit down the right side of the bottom one provides a way to slip the bottom paper in and out. I did the same for performance and separated the two with sticky-note tabs to make things even handier. I’m very pleased with this method. The individual pockets also allow me to easily store relevant notes with reference material. For example, my little sketch that reminds me how far apart lope-over poles should be can be tucked in with the western trail pattern. I was a little bit stymied when it came to organizing my wee little text only bits (for pleasure classes or other relatively simple events). I almost gave up and put them all together in a sleeve, but was saved from that terrible tragedy by some sweet card holder sleeves (again from Goodwill). These divided each sheet into four pockets, and from there I could easily delineate more with staples. Voila! It’s beautiful. My heart will sing a little song every time I use my handy dandy newly organized reference binder. Is it Saturday yet? In addition to my horses who annoyingly needed touch ups before the show last week, I also had one snotty little guy who chose to break in transit. Alas, the issue was too much to be fixed at the show with my basic kit so he got wrapped back up and sent home. This incident, and some frustration with finding my horses, inspired me to spend some of this week improving my packing procedures. 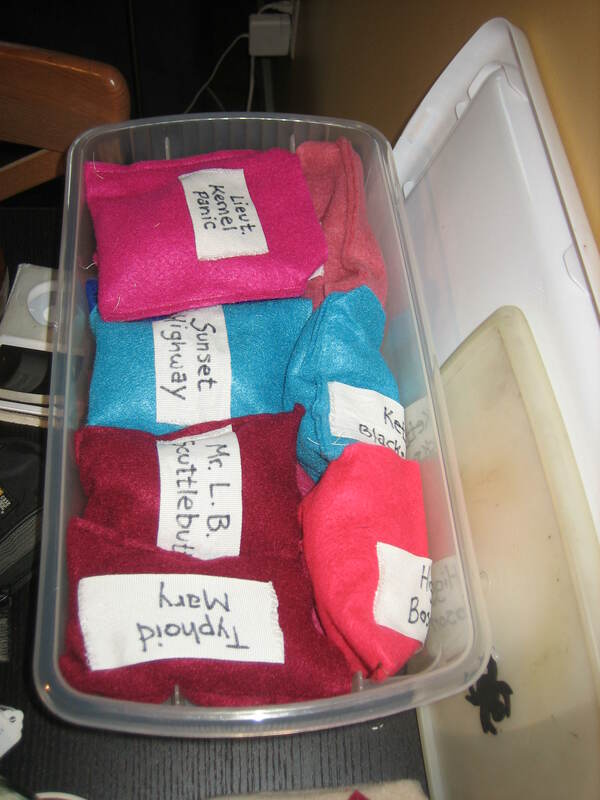 Many of my horses already had fleece bags, but I decided to actually assign one to each horse and label it so I could find them. Also, I wanted to find a good, reliable, reusable way of padding on ears and tails and other fragile bits. 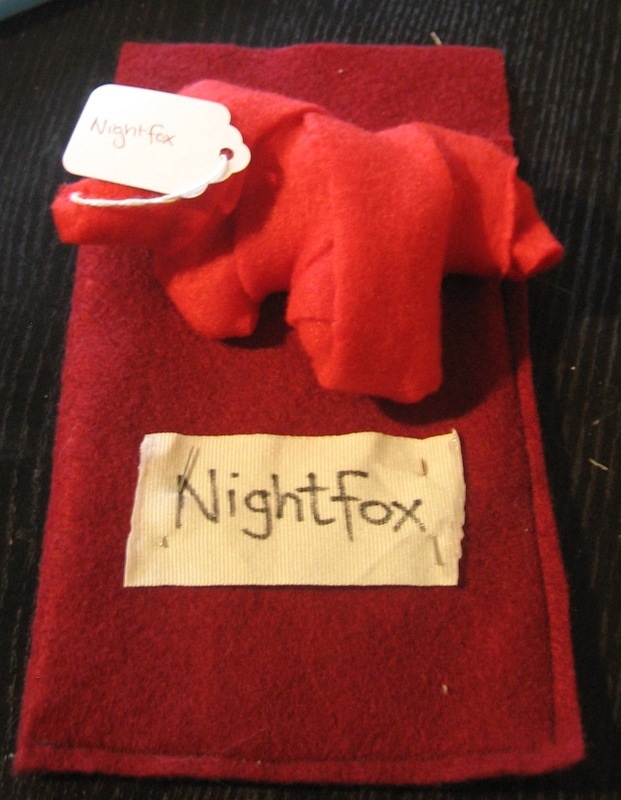 So, in addition to making more bags and adding labels, I got my hands on some lovely red fleece. 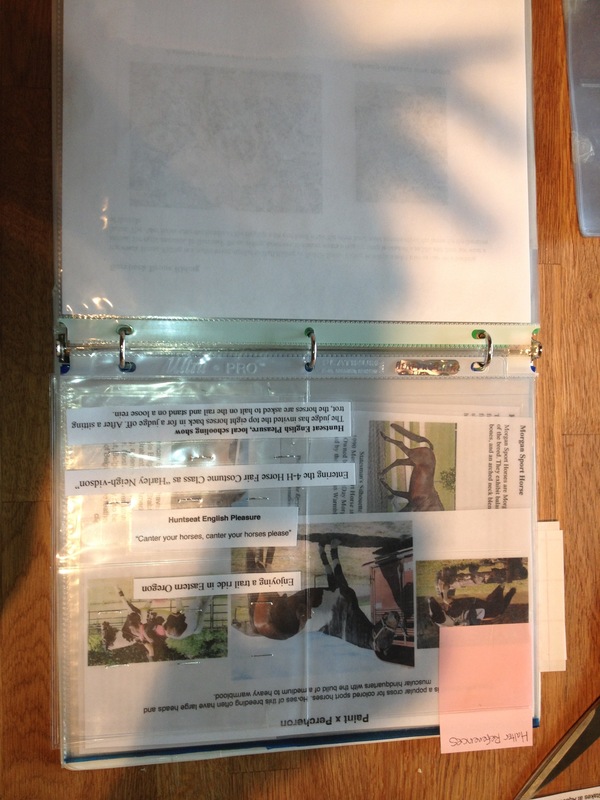 I cut it into 18″ strips and used those to wrap the horses and brace the more fragile bits. I like this as an alternative to toilet paper because it’s thicker and very reusable. I sewed the bags on a machine but did the labels by hand. 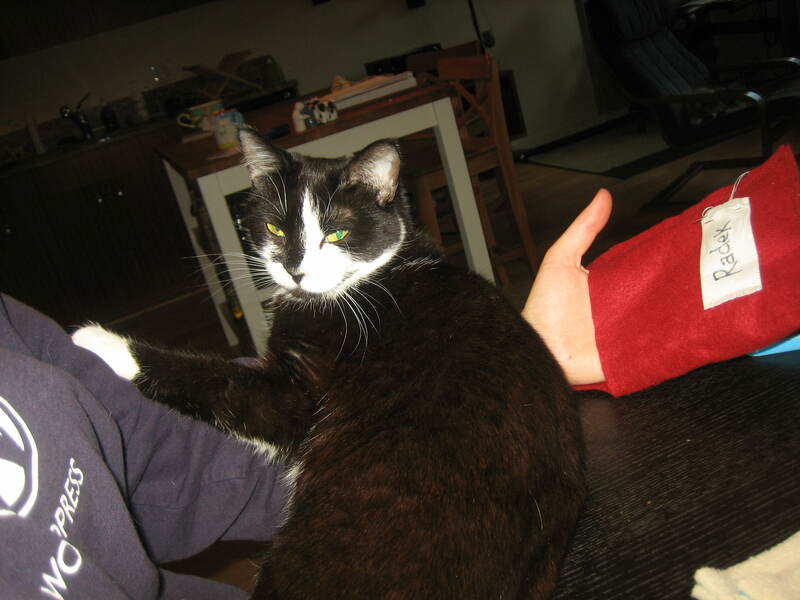 My cat thought it would be really helpful if she sat on my arm while I was sewing. She was wrong, but cute. Besides the petulant Alpo, I’ve got two horses getting repairs or upgrades. I’m hoping I’ll finish all three before my show this weekend, but since Alpo is getting a whole new paint job (sigh) that’s rather a tall order. We’ll see! One of my favorite things about live showing is that I have an excuse to be freakishly organized. I love organizing and lists and such, and live showing can include a lot of those. Maybe the most important (and helpful) thing I do is make what I call an Entry Draft. Basically, I take the show class list and edit it so that each of my horses is listed under their respective class(es). 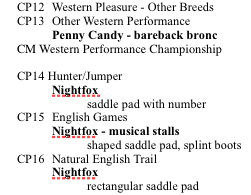 As the show goes on, I cross of the entries and mark placings. That way I hopefully never miss a class. 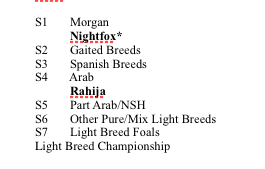 In the light breed division I have two horses, Rahija and Nightfox. 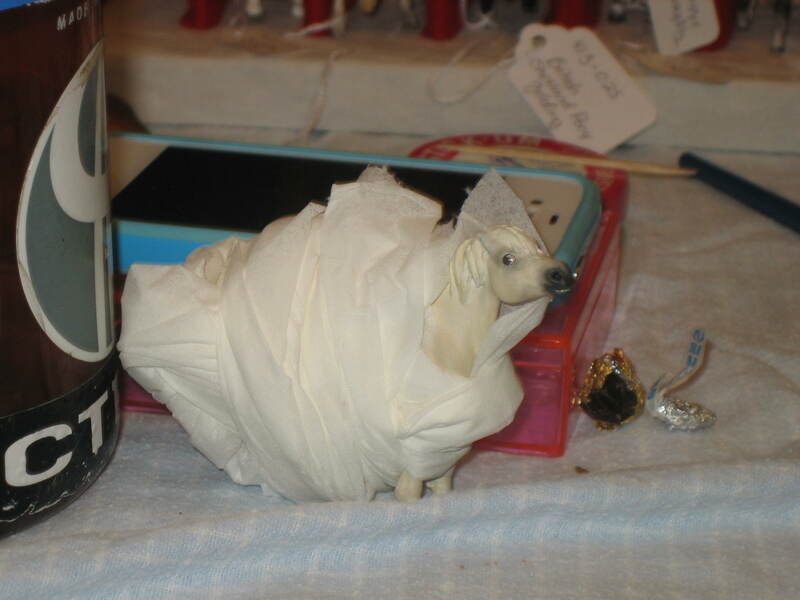 Generally, an Arabian entry won’t need any documentation, so only the model herself needs to go on the table. That would usually be true for Morgans too, but since Nightfox is a Morgan Sport Horse, he gets shown with documention, as indicated by the asterisk*. I also make notes for my performance entries. Performance showing can be really complicated, and I don’t want to forget a little important thing and facepalm later. 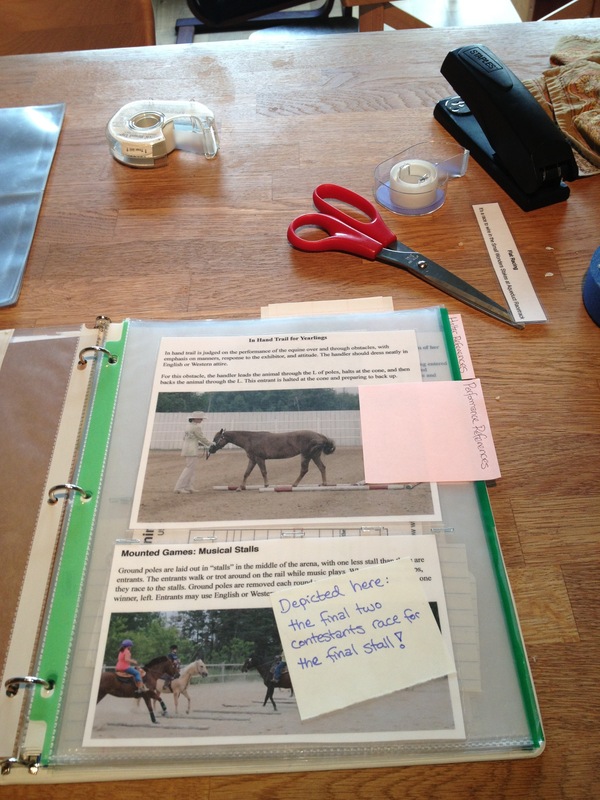 I mark not only the horse and event, but also notes that I might otherwise forget. I’m sure I’ll remember my jump for Hunter/Jumper, but will I remember that the horses have rectangular saddle pads with numbers? But for the next class, the numbered pad doesn’t make as much sense, so I’ll switch him to the shaped one. He switches again to a plain rectangular one for trail, and then into a rounded one for dressage. Thank goodness he wears the same bridle for all these events! I’m usually nit-picking at my Entries Draft right up until the night before the show, so the most important thing is to set a reminder to print it! I would be lost without my precious lists. Since I’ll be showing in performance at the show this weekend, my show kit is quite a bit more extensive than for an all-halter show. I’m sharing a table for the Expo, so I want my kit to be complete, but also contained and organized. A few weeks ago I hit on the idea of using one of my sets of plastic drawers. Right now, that misc. 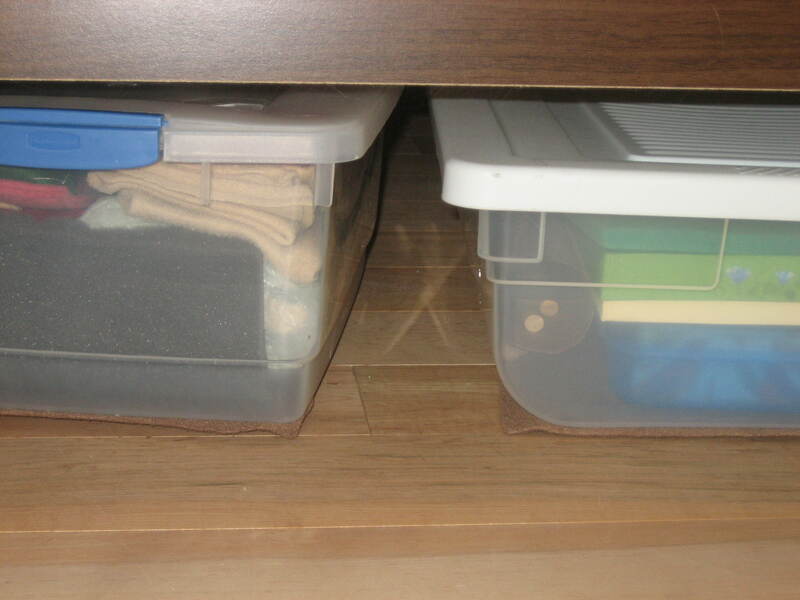 stuff is living under the bed (in yet another storage tub) so that I can use the drawers for my live show goodies. Isn’t it beautiful? In the top drawer, I have all of my little performance supplies like sticky wax and tweezers, touch up paint for my props, extra leg tags, pens, and other handy little things. 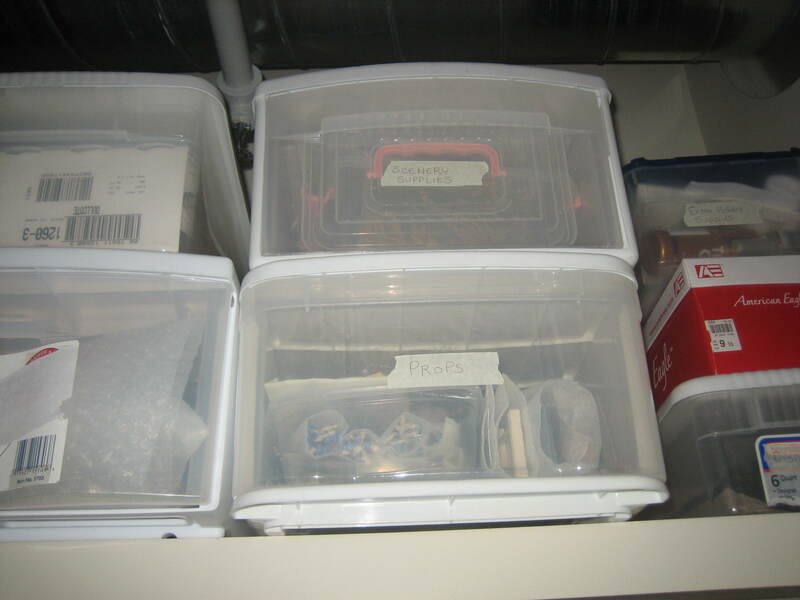 In the middle drawer, I have all of my performance props and tack. One of the advantages to showing minis is that it actually fits in one drawer! 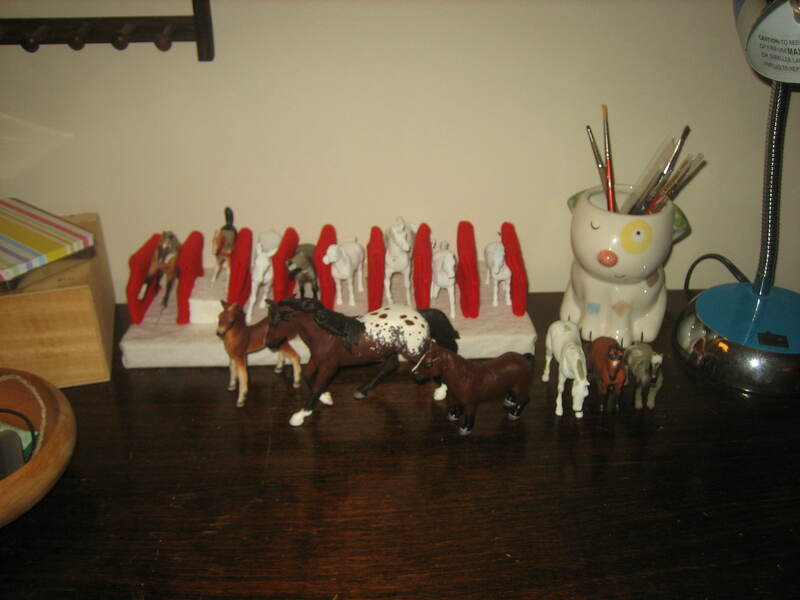 The bottom drawer was empty when I took the picture, but now holds all of the horses who are entering performance, so they’re right on hand first thing. CM Performance starts at 8am, so I want to be ready! The last step was to tape the drawers securely in place for the drive down, and now we’re ready to hit the road this evening. Photos and more to come after the weekend! 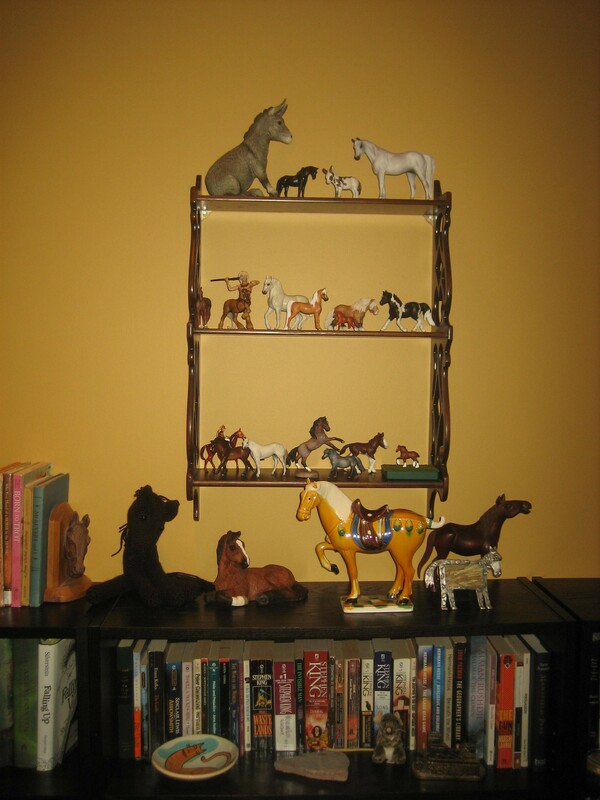 The ponies on their new wall shelf above the books, with my horse book collection starting off to the left and my other Horse Shaped Objects below. WiP horses congregate on my dresser. A few more are packed up while I concentrate on their friends. Hopefully this very public set up will help keep me motivated and focused. Supply shelving at the end of the bed. Above my clothes, the closet shelf is 85% horse supplies. Phew! It feels good to have that done. At this point we are mostly moved in. We still need to put up wall art, organize the camping supplies, and buy and add a few new things. But it’s getting there. 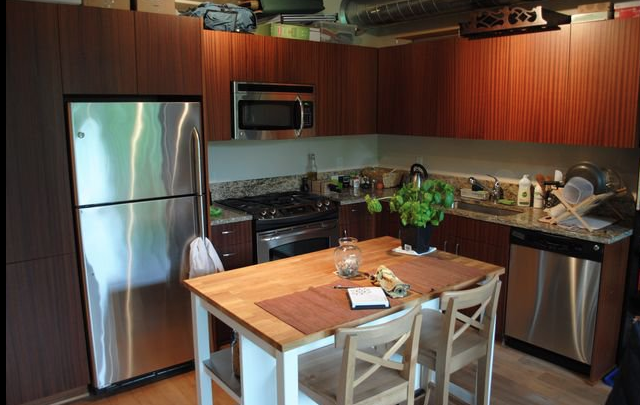 I’m very happy to have a lovely space to work in the main room, on our beautiful kitchen island. We may also be getting a counter-height bar table that I could potentially also use. And (hurrah!) 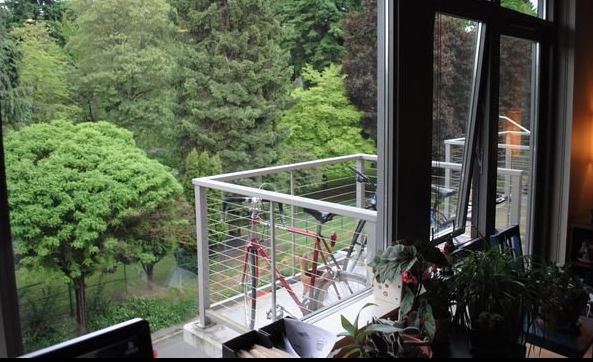 our lovely little balcony… there’s definitely some more photo showing in my future. 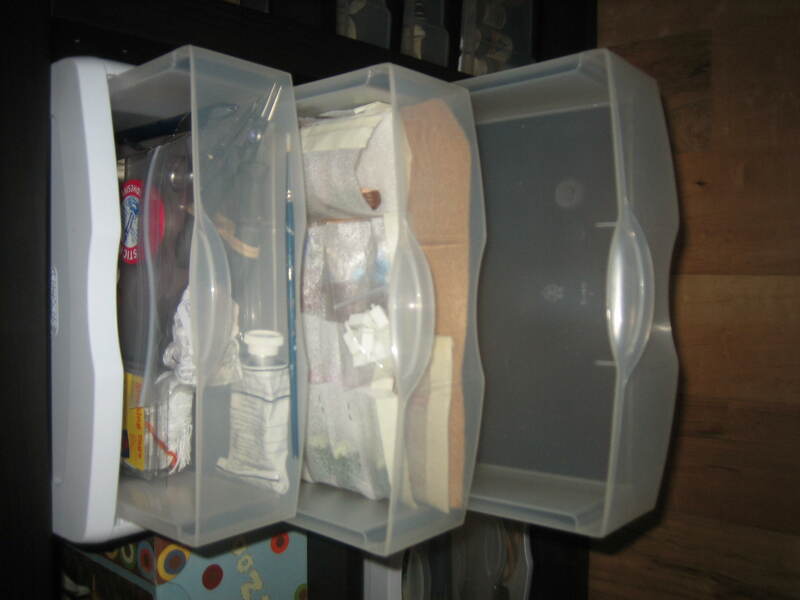 I only wish I had a “before” picture to compare…this is MUCH more condensed, organized and practical! 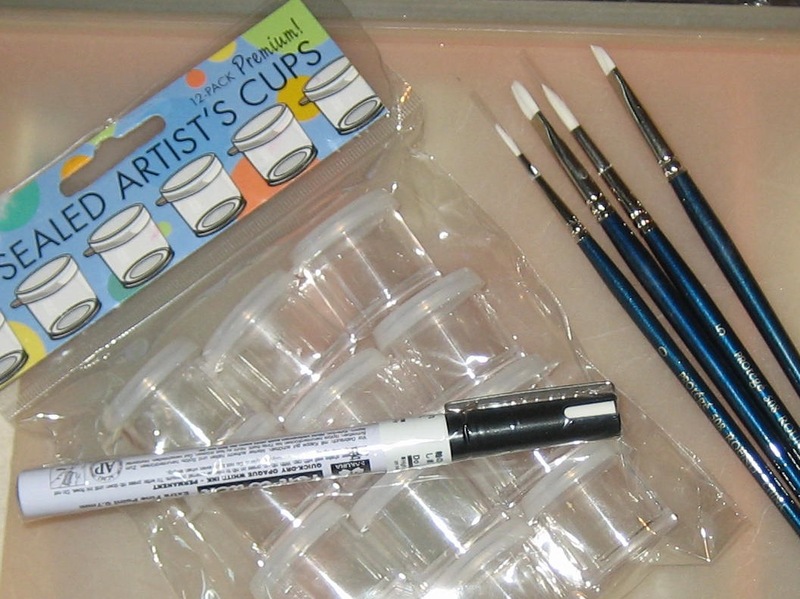 As I’ve mentioned before, I love to find plastic containers to use for hobby things at Goodwill or similar thrift stores. If you shop often you can easily find what you need and at a fraction of the item’s price new. 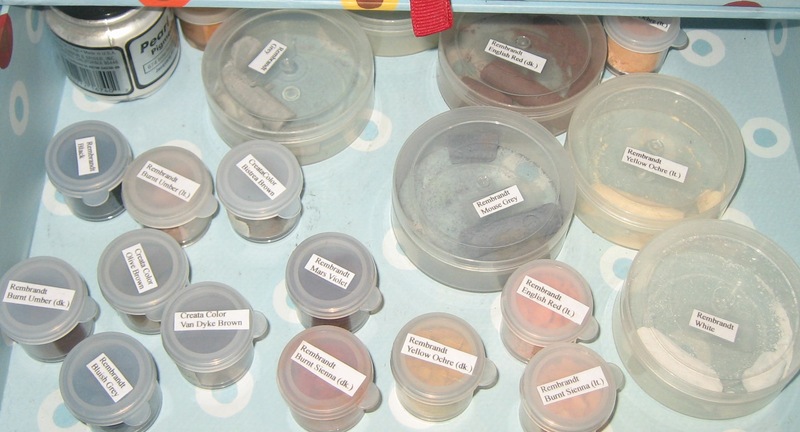 My main goal with this reorganization was to divide my hobby stuff into activities, so that all of my pastelling tools were in one container, prepping and sculpting in another, etc. 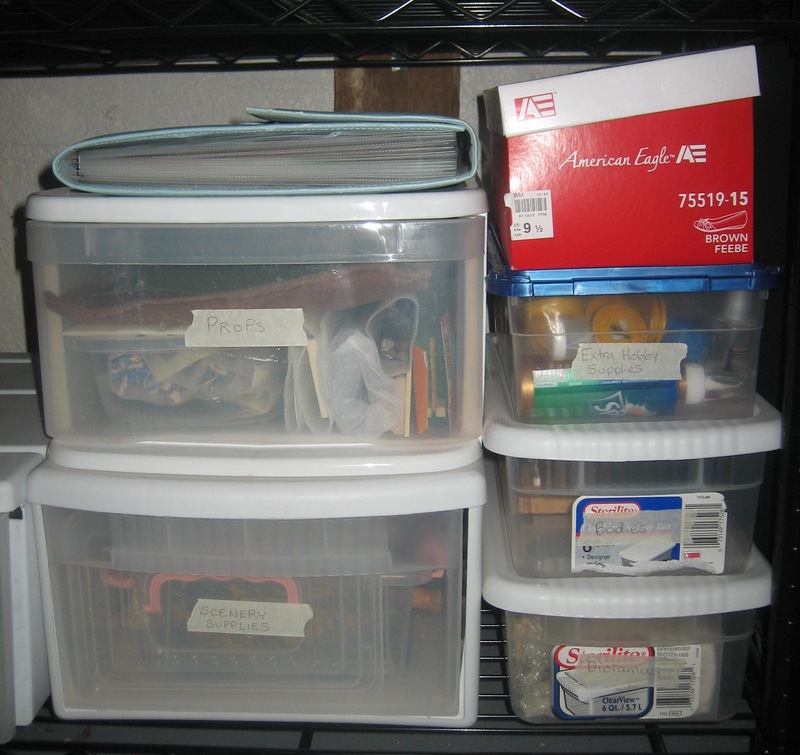 Before I had too many little boxes, and I’ve transferred to fewer, slightly larger and more orderly containers. 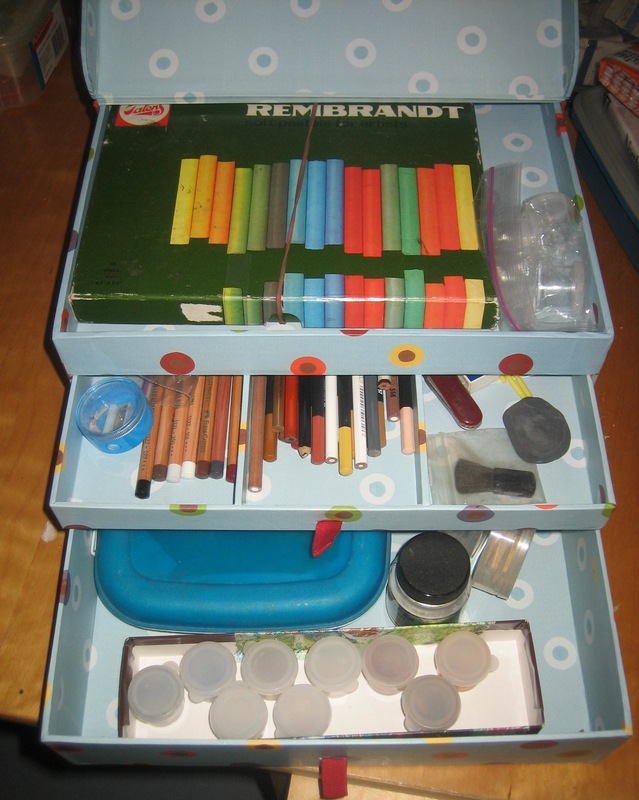 I’m particularly happy with this find, which now holds my pastel and colored pencil supplies. I was lucky to find the perfect container. Handily, you can sometimes make a thrift store find into the perfect container- with a bit of creativity and work. I had been using a bead container (easily found at Goodwill for half off the new price) for my tack. 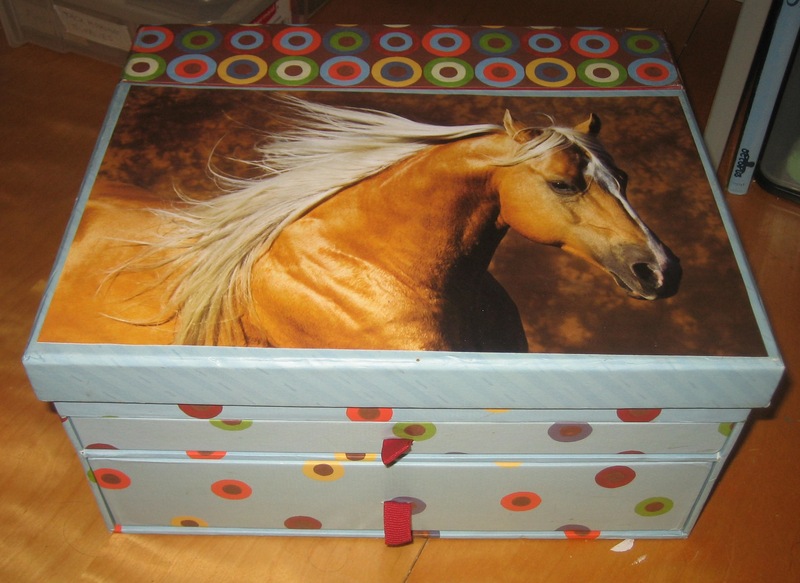 The only problem was that the divisions in the box weren’t quite right, and I couldn’t fit in my sticky wax or my smaller container of micro mini tack (it has little tiny pockets, perfect for those ridiculous .5 inch saddles). So I took my dremel and a large file to it and made it better. Perfect! 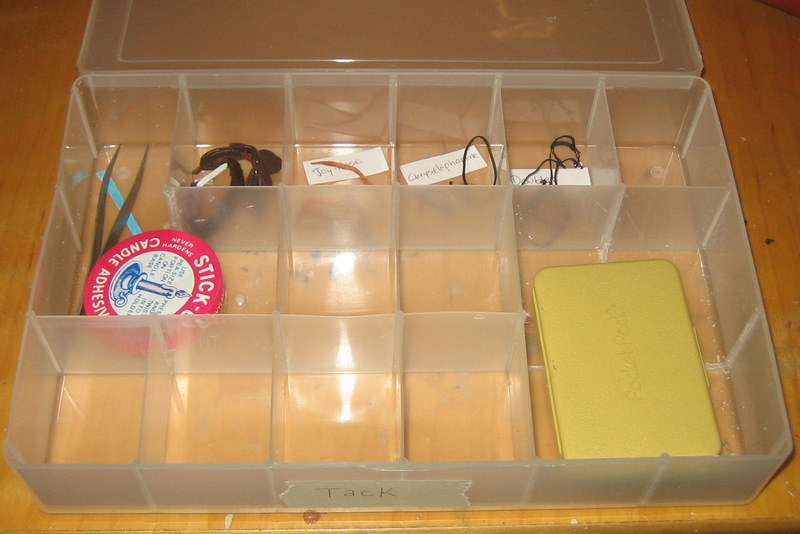 There’s still room for plenty of tack and when I finally do run out of space I’ll be able to find a similar container on the cheap and if necessary, modify it to fit my needs. 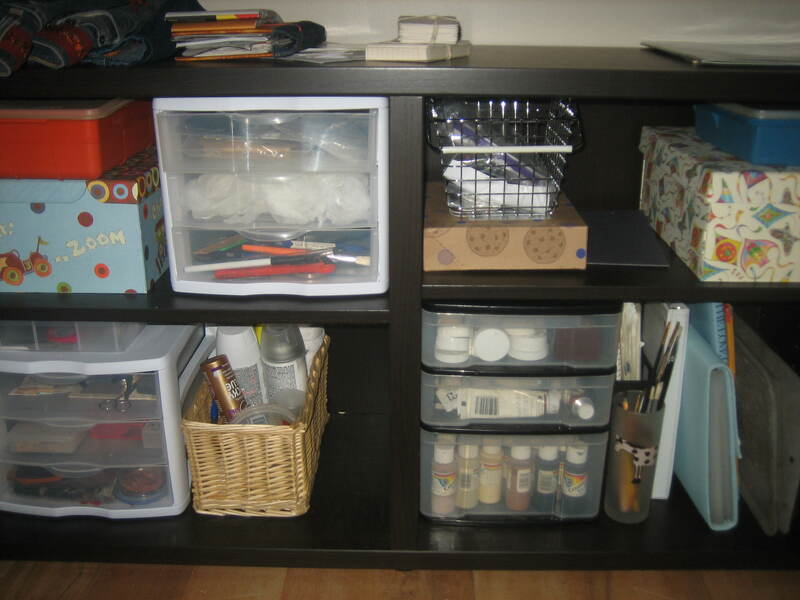 My deep love for storage containers may be a little over the top, but it sure does keep things orderly around here- and wherever my craft area will be in the new place.